The noble savage is an old term. "Savage" is a new term. A detail from Benjamin West's The Death of General Wolfe, an idealized picture of an American Indian. The term "noble savage" is an idea people had: Without civilization, humans are essentially good; it is civilization that makes them act in bad ways. The idea started in the 17th century and developed in the 18th century. One of the first to express it was Shaftesbury. He told the would-be author “to search for that simplicity of manners, and innocence of behaviour, which has been often known among mere savages; ere they were corrupted by our commerce” (Advice to an Author, Part III.iii). His counter to the doctrine of original sin, born amid the optimistic atmosphere of Renaissance humanism, was taken up by another author who lived at the same time, the essayist Richard Steele, who attributed the corruption of contemporary manners to false education. In the eighteenth-century cult of "Primitivism" the noble savage, uncorrupted by the influences of civilization, was considered more worthy, more authentically noble than the contemporary product of civilized training. Although the phrase noble savage first appeared in Dryden's The Conquest of Granada (1672), the idealized picture of "nature's gentleman" was an aspect of eighteenth-century sentimentalism, among other forces at work. 2 Origin of term "Noble Savage"
During the seventeenth century, as an aspect of Romantic "Primitivism", the figure of the "Good Savage" was held up as a reproach to European civilization, then in the throes of savage wars of religion. People were especially horrified by the Massacre of Saint Bartholomew (1572), in which some 20,000 men, women, and children were massacred, chiefly in Paris, but also throughout France, in a three-day period. This led Montaigne to write his famous essay "Of Cannibals" (1587), in which he stated that although cannibals ceremoniously eat each other, Europeans behave even more barbarously and burn each other alive for disagreeing about religion. The treatment of indigenous peoples by the Spanish Conquistadors also produced a great deal of bad conscience and recriminations. Bartolomé de las Casas, who witnessed it, may have been the first to idealize the simple life of the indigenous Americans. He and other observers praised the simple manners of the indigenous Americans and reported that they were incapable of lying. European guilt over colonialism, with its use of recently invented guns on people who did not have them inspired fictional treatments such as Aphra Behn's novel Oroonoko, or the Royal Slave, about a slave revolt in Surinam in the West Indies. Behn's story was not primarily a protest against slavery but was written for money; and it met readers' expectations by following the conventions of the European romance novella. The leader of the revolt, Oroonoko, is truly noble in that he is a hereditary African prince, and he laments his lost African homeland in the traditional terms of a Golden Age. He is not a savage but dresses and behaves like a European aristocrat. 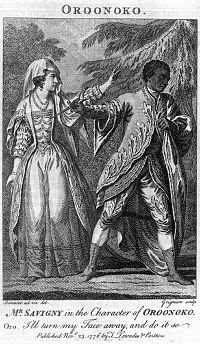 Behn's story was adapted for the stage by Irish playwright Thomas Southerne, who stressed its sentimental aspects, and as time went on it came to be seen as addressing the issues of slavery and colonialism, remaining very popular throughout the Eighteenth Century. In English, the phrase Noble Savage first appeared in Dryden's play, The Conquest of Granada (1672): "I am as free as nature first made man, / Ere the base laws of servitude began, / When wild in woods the noble savage ran." However, the term "Noble Savage" only began to be widely used in the last half of the nineteenth century and then as a term of disparagement. In French the term had been the "Good Savage" (or good "Wild man"), and, in French (and even in eighteenth-century English), the word "savage" did not necessarily have the connotations of cruelty we now associate with it, but meant "wild" as in a wild flower. The idealized picture of "Nature's Gentleman" was an aspect of eighteenth-century sentimentalism, along with other stock figures such as, the Virtuous Milkmaid, the Servant-More-Clever-than-the-Master (such as Sancho Panza and Figaro, among countless others), and the general theme of virtue in the lowly born. Nature's Gentleman, whether European-born or exotic, takes his place among these tropes, along with the Wise Egyptian, Persian, and Chinaman. He had always existed, from the time of the epic of Gilgamesh, where he appears as Enkiddu, the wild-but-good man who lives with animals; and the untutored-but-noble medieval knight, Parsifal. Even the Biblical David the shepherd boy, falls into this category. Indeed, that virtue and lowly birth can coexist is a time-honored tenet of Abrahamic religion, most conspicuously so in the case of the Founder of the Christian religion. Likewise, the idea that withdrawal from society—and specifically from cities—is associated with virtue, is originally a religious one. Hayy ibn Yaqdhan an Islamic philosophical tale (or thought experiment) by Ibn Tufail from twelfth-century Andalusia, straddles the divide between the religious and the secular. The tale is of interest because it was known to the New England Puritan divine, Cotton Mather. Translated in to English (from Latin) in 1686 and 1708, it tells the story of Hayy, a wild child, raised by a gazelle, without human contact, on a deserted island in the Indian Ocean. Purely through the use of his reason, Hayy goes through all the gradations of knowledge before emerging into human society, where he revealed to be a believer of Natural religion, which Cotton Mather, as a Christian Divine, identified with Primitive Christianity. The figure of Hayy is both a Natural man and a Wise Persian, but not a Noble Savage. Pope's poem expresses the typical Age of Reason belief that men are everywhere and in all times the same, which was also Christian doctrine (Pope was a Catholic). He portrays his Indian as a victim ("the poor Indian"), who, although less learned and with less aspirations than his European counterpart, is as good or better and hence equally worthy of salvation. He is a "bon sauvage", but not a noble one. In the first century CE, all of these qualities had been attributed by Tacitus to the German barbarians in his Germania, in which he contrasted them repeatedly with the softened, Romanized, corrupted Gauls, by inference criticizing his own Roman culture for getting away from its roots—which was the perennial function of such comparisons. The Germans did not inhabit a "Golden Age" of ease, but were tough and inured to hardship, qualities which Tacitus saw as preferable to the "softness" of civilized life. In antiquity this form of "hard Primitivism", whether viewed as desirable or seen as something to escape, co-existed in rhetorical opposition to the "soft Primitivism" of visions of a lost Golden Age of ease and plenty. ↑ "In French, sauvage does not necessarily connote either fierceness or moral degradation; it may simply mean 'wild', as in fleurs sauvages, 'wildflowers'. The term once carried this kinder and gentler connotation in English as well. Dryden who picked up and used Lescarbot's term "noble savage" also wrote in 1697, 'Thus the savage cherry grows. . .' (OED 'Savage', A,I,3); and Shelley. . . wrote in 1820 in his 'Ode to Liberty', 'The vine, the corn, the olive mild / Grew savage yet, to human use unreconciled' (OED 'Savage' A, I, 3)", Ter Elllingson, The Myth of the Noble Savage (University of California, 2001) p. 377. Ellingson believes that Dryden picked up the phrase from a 1609 travelogue about Canada by the French explorer Marc Lescarbot, in which there was a chapter heading: "The Savages are Truly Noble," meaning that they enjoyed the right to hunt game, a privilege in France granted only to hereditary aristocrats. The hero who speaks these words in Dryden's The Conquest of Granada, is a Spanish Muslim, who, at the end of the play, is revealed to be the son of a Christian prince. ↑ See Doyle R. Quiggle, “Ibn Tufayl's Hayy Ibn Yaqdan in New England: A Spanish-Islamic Tale in Cotton Mather's Christian Philosopher?” Arizona Quarterly: A Journal of American Literature, Culture, and Theory, 64: 2, (Summer 2008): 1-32. ↑ Tobias Smollett, The Adventures of Humphrey Clinker, ( London: Penguin Books, 1967), p. 292. Berkhofer, Robert F. "The White Man's Indian: Images of the American Indian from Columbus to the Present"
Deloria, Vine, Jr. "The Pretend Indian: Images of Native Americans in the Movies"
Hazard, Paul(1947). The European Mind (1690-1715). Cleveland, Ohio: Meridian Books. Keeley, Lawrence H. War Before Civilization: The Myth of the Peaceful Savage. Oxford: University Press, 1996. Rollins, Peter C. "Hollywood's Indian : the portrayal of the Native American in film"
Eric R. Wolf, 1982. Europe and the People without History'.' Berkeley: University of California Press. Dictionary of the History of Ideas", "Primitivism in the Eighteenth Century".